Please scroll down to see the pieces. 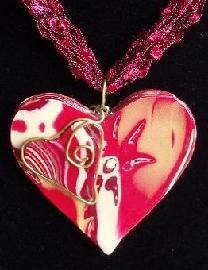 Straight From the HeART is one-of-a-kind, hand crafted jewelry. It is not meant to be perfect but to be an expression of artistic spirit, Straight from MY Heart! Pieces are available online, at art shows, and at home shows. I enthusiastically accept custom orders to match any outfit. Email me if you would like to learn how to earn free jewelry by having a personal shopping social with your friends! Order your next gift from Straight From the HeART, knowing it was made with love. Gifts can be wrapped and shipped with a hand written card. I hope my art will make you smile as much as it does me! All items include satin pouch, ready for gift giving. Items are moving too fast to continue selling from the website, so please email me or visit my Facebook page, Straight from the Heart by Suzette.